But the man who John O’Mahony is rumoured to be in line to replace, incumbent North West MEP Jim Higgins, insists he’s very confident of winning the nomination. A FINE GAEL TD has played down speculation he might run in the European elections next year although he has not ruled out standing for the party if a vacancy arises. John O’Mahony, one of four Fine Gael TDs in Taoiseach Enda Kenny’s Mayo stronghold, was responding to a report in the Irish Independent today that he is being considered to replace the party’s North West MEP Jim Higgins in next year’s European elections. “It’s like this: there is a sitting MEP in the north-west at the minute and I have always made it clear I am a close colleague [of Higgins]. I’m not in the business of trying to oust anyone. If it was a vacancy it would be a different thing,” O’Mahony told TheJournal.ie today. However Higgins insisted to this website this evening that he is confident of retaining the seat for the party. The rationale for selecting O’Mahony lies in the fact that Fine Gael is unlikely to retain its four TDs in a redrawn Mayo constituency at the next general election with the five-seater reduced to four. 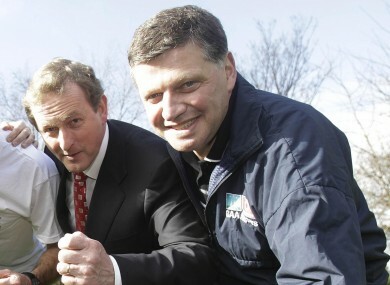 However his Dáil departure would mean a tricky by-election contest for the government. O’Mahony added that he was at the service of the party hierarchy and pointed out that he ran for the Dáil because Fine Gael asked him to. Email “This Fine Gael TD is not ruling out a European Parliament bid next year ”. Feedback on “This Fine Gael TD is not ruling out a European Parliament bid next year ”.